I have been working on building an all-iron battery. A cheap storage solution needs to happen soon: the pacific northwest has such an abundance of electricity that Bonneville Power needed to shut down wind turbines to deal with the surplus. For stationary batteries, weight and performance are less important than cost. An iron battery is likely to be cheap. 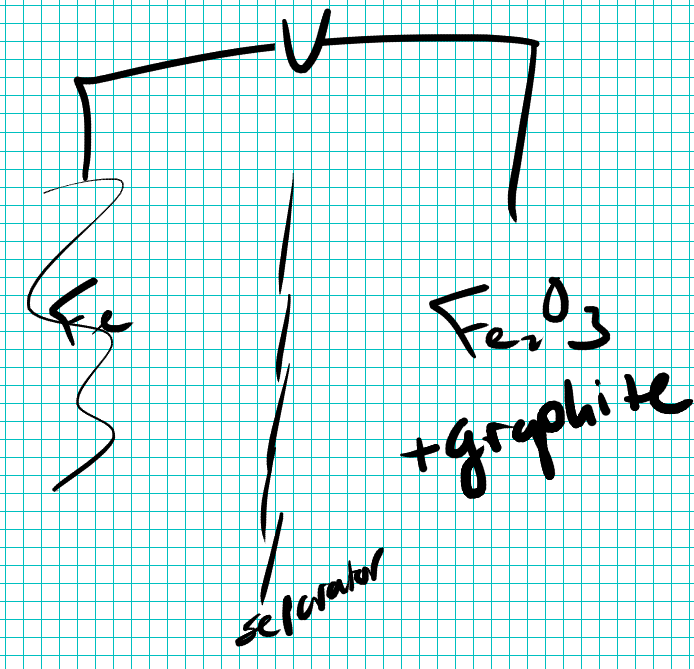 Iron is a very cheap material and iron chemistry doesn’t require special handling for air-sensitivity or toxicity. I ran the numbers. If the world used all of its lead, lithium or iron to build a battery, lead and lithium would be small as a percentage of the grid. Iron looks pretty good. We could make a grid scale iron battery without disrupting the iron market. So how would an iron battery work? First, we need an anode. That’s easy: we can use the Edison Cell anode made of iron and iron hydroxide. It’s an old technology and is very robust. We also need a cathode. We need an iron chemical that can be easily reduced. That means some form of Iron(III). Rust, basically. A solid would be great, and a conductive solid would be even better. I tried iron oxide. That didn’t work. 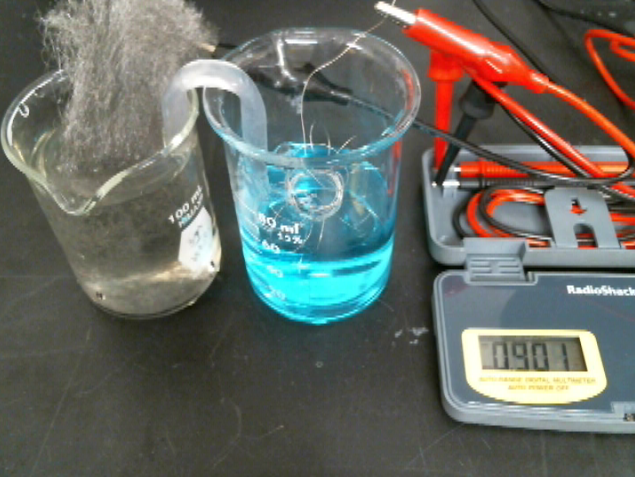 It can absorb an electron, and it’s solid, but it’s not conducive and I couldn’t get significant current. I gave up on having an all-solid chemistry. I decided to try Iron(III)EDTA which is nicely soluble in water. I made the first version of this cell that seemed to work. I tested the design with an iron/copper cell. Half of the Edison Cell and half of the Daniell Cell. I made a salt bridge with 1M KCl and agarose. 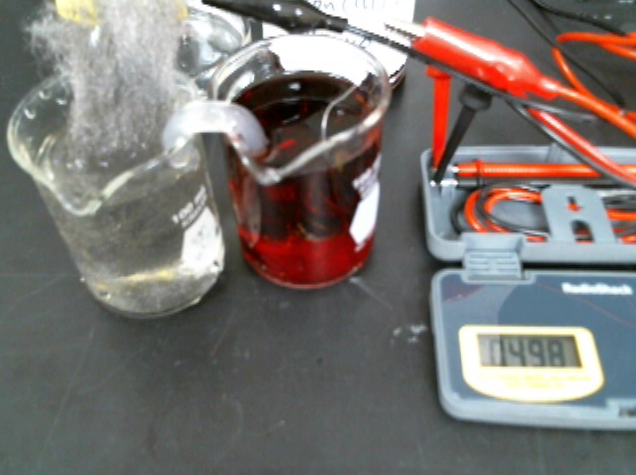 The result gave 0.9 V.
For all-iron chemistry, I kept steel wool on the anode side. Then I replaced the copper with iron/EDTA. I made a ~0.1 M solution of Iron (III) EDTA in pH 8 buffer (a little Tris/acetate that I had lying around; probably not ideal). I connected up the cathode with a bit of nichrome wire (I would prefer to soak the iron solution into conductive graphite, but I started simple). That gave 0.5 V. So it works, at least a little. Now I need to make it better. I also just wanted to mention that I “vlog” about this and other things every Monday to Friday. I’m sometimes talking about other projects, but for whatever reason, I’m feeling a bit obsessive with this one. I hope this becomes a somewhat practical battery that folks could make according to a DIY video. Maybe that would be useful to somebody (even if only as a science fair project). This entry was posted in Science on May 19, 2017 by Peter.